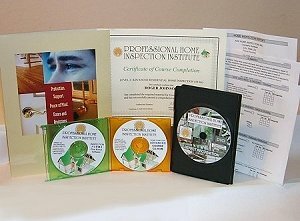 PHII's Online Advanced Course is 32 hours and contains 13 lessons with over 600 test questions and flashcards that provide continuing education and exam preparation for home inspectors who have already obtained home inspector certification. This course is excellent preparation for exams such as the National Home Inspector Examination (NHIE). Course lessons take an in-depth look at light construction systems, components and code requirements that home inspectors will need to know to pass the NHIE. The course also covers home inspection report analysis, business operations, liability, professional ethics and ancillary inspections such as swimming pools and lawn irrigation systems, that while not required for a home inspection, are required topics for taking the NHIE. When you finish the course and pass the final exams, you will possess the knowledge and skills needed to pass many different types of exams. You will aso feel more confident and informed about all areas of residential home inspection. The building codes typically covered on state and national home inspector exams. An in-depth look at many HVAC systems. How to complete an exceptional home inspection report that conforms to national standards. Online Course Access and optional back-up CD, Online Flashcards & Testing, Certificate of Completion, Companion DVD, Toll Free Student Support.